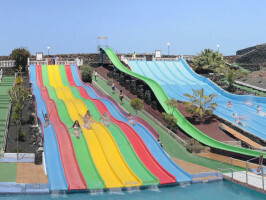 Come and enjoy the Aquapark Costa Teguise, the largest theme park in Lanzarote, for an action packed day of fun and excitement for all the family. Boasting 22,500 square metres of entertainment and attractions from water slides to indoor paintballing, spectacular Jacuzzi pools to electric cars and games areas, there is something for everyone. Whether relaxing in the sun or chasing adrenalin, you are sure to find what you are looking for at Aquapark Costa Teguise. Push yourself to the limit with the stunning selection of waterslides on offer. Catering to various ages, the slides have been designed to maximise your adrenaline rush from the Kamikaze to the Black Hole, the Hydrotube to the Whirl-water and many more. 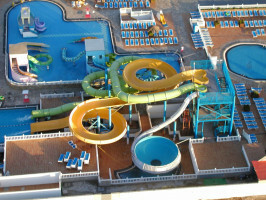 Younger children can also enjoy the spiral slide, the track slides and the child kamikaze. For the youngest of all there is a special water playground filled with small sides and surprises. Immerse yourself in the warzone at the only indoor paintball arena in Lanzarote. Test your aim and strategy as you engage in combat with your enemies as you fight for glory. Including special effects, obstacles and hidden booby-traps, the game is sure to get your adrenaline flowing. Afterwards why not head over to the Adventure Park and attempt the electric car circuit. With big and small cars available, both adults and children can enjoy the track and traverse the various obstacles. Free Wifi available. The park has restaurants, a hammock area, lockers and a shop. Children's rate applies in children from 4 to 12 years old. 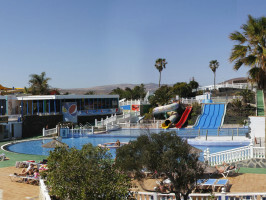 Meeting point: Aquapark Costa Teguise Avenida del Golf - Parcela 315, Costa Teguise 35.508. Opening hours: Open every day from 10:00 to 18:00 hours.